A career in education can be one of the most challenging and rewarding paths a young person on the verge of deciding their future can take. Elementary school teachers are in the unique position of shaping the foundational ideas of young children, which gives them an added level of responsibility. After all, who doesn’t remember your favorite elementary school teacher? Unlike middle or high school teachers, elementary school teachers typically require a more diverse set of skills since younger children need not only instructional content, but developmental support as they learn how to learn. Science at the elementary level can be a chance to share passion and excitement for the natural forces that shape our world, and teach children the basics for being responsible citizens interested in taking care of their environment. 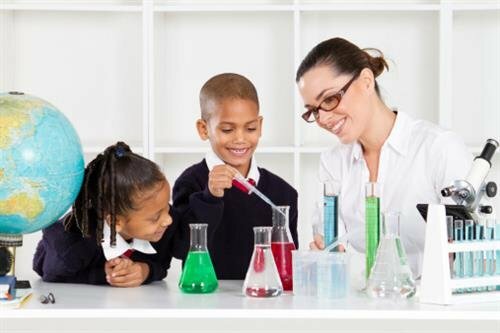 Once you’ve made the decision to take the leap towards a career in elementary school science, you’ll need to earn a bachelor’s degree and begin working towards your teacher certification. Many school districts accept teachers who are certified through a non-traditional program. This means that even if you have a degree in a non-education field, you may be eligible to teach while completing a certification course either at a local university or through an accredited online program. Much has been made of the teacher shortages in Math and Science over the last decade. As a 2009 paper from the Consortium for Policy Research in Education makes clear, this is a very complicated problem with no easy solutions. However, one simple fact in this complex equation is that schools need qualified science teachers at all levels. Becoming an excellent elementary school science teacher means committing to working hard, mastering your subject matter, and staying in the classroom for the long haul. Thanks to the gradual shift in education policy over the last few years, more and more research in education supports the idea that quality science programs must begin at the elementary school level. The National Science Teachers Association states that ongoing professional development is a key component in training and retaining quality elementary school science teachers. As you look for programs to support you in your goal of becoming an elementary school science teacher, check with the requirements in your local district or state to see what you’ll need to do in order to be qualified for the classroom. Several online options are available to begin studying for nationwide science subject area exams, which are a great idea if you’re considering moving up into middle school or secondary science down the road. If you’re content with working in elementary school, then you should expect to take several courses on early childhood development and classroom management in additional to science related courses. The Bureau of Labor Statistics reports that the median elementary school teacher salary in 2010 was $51,380. The BLS also reports that number of available elementary school teaching jobs are expected to grow as much as 17% by 2020, making this a solid prospect for young people at the start of their careers. To access more content about careers in education, please fill out our sign-up form regularly, and check back for education related news and updates!